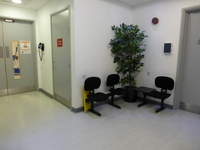 Services / facilities within the building include brain scanning facilities, consultation rooms and staff offices. 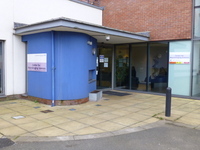 This is a specialist centre for neuroimaging facilities for the diagnosis, treatment and research of psychological and psychiatric conditions. Public access to the building is from De Crespigny Park. 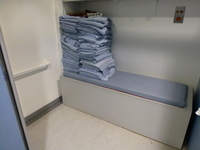 Scanning facilities and consultation rooms are located on the ground floor. Staff offices and research facilities are located on the upper floors. You are on Getting Here (Maudsley Hospital). Skip to the next section. Maudsley Hospital is located in Camberwell, South London just off Denmark Hill. It is approximately 0.6 km from the A202 (Peckham Road) which gives access to the A3 and A23 to the West and the A2 and 20 to the East. 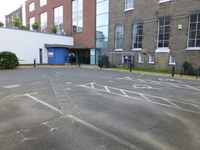 The Hospital has its own car park which is located at the front of the hospital. Blue Badge bays are available. 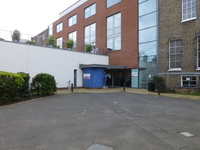 The nearest bus stop is Kings College (Stop A) which is located on Denmark Hill and is approximately 90 metres from the main hospital entrance. Services that stop here are the 42, 68, 468 and N68. The nearest train station is Denmark Hill approximately 200 metres away located to the South of the hospital site. The nearest tube station is Brixton, approximately 2.3 km away via Denmark Hill, Cold Harbour Lane, Lilford Road and Brixton Road. The following link is for Traveline Journey Planner. The venue is situated within the centre of the borough. This venue is situated in Southwark. The nearest mainline station is Denmark Hill. The nearest underground station is Brixton. Click here for access information of the overall hospital grounds. Click here for details of the parking available within the hospital grounds. You are on Parking (Neurological Imaging Services Patient Car Park). Skip to the next section. 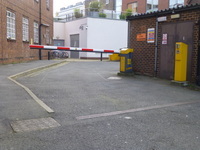 The dimensions of the designated parking bay(s) are 350cm x 500cm (11ft x 16ft). The nearest designated bay is 15m (16yd 15in) from the main entrance. 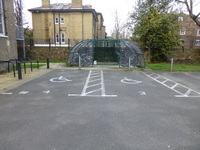 The furthest designated bay is 18m (19yd 2ft) from the main entrance. The car park entrance is on De Crespigny Park. 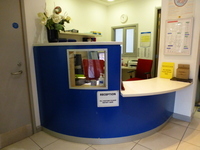 There is an automated barrier at the entrance which is operated by reception staff after contact via the intercom. The intercom is within reach of the vehicle driver. The car park is level with the paving leading to the entrance. You are on Level Change (Pedestrian Route to Main Entrance). Skip to the next section. The ramp or slope is located leading from De Crespigny Park into the car park. This slope is bypassed if arriving by car. The door opening is 148cm (4ft) wide. 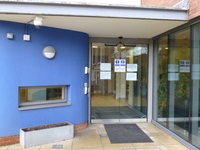 The powered doors are operated by reception staff after contact via the intercom. There are intercoms at both wheelchair and standing height. The exit button to operate the doors is within reach of a wheelchair user. Music is played in the waiting area. 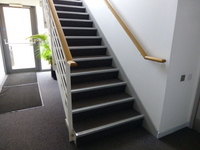 The stairs are located at the right hand end of the corridor, after the entrance foyer. 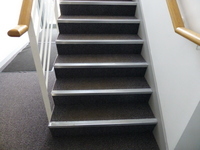 The stairs are approximately 30m from the main entrance. 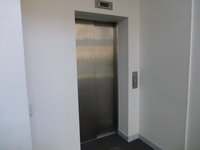 The lift is located within the staff areas. 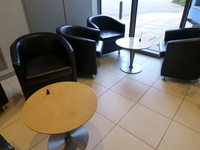 The waiting room / area is approximately 5m from the main entrance. The type of flooring is tiles. The room surveyed was Interview Room. The consultation / treatment room is 12m (13yd 4in) from the main entrance. There are doors into the consultation / treatment room. The bed / couch is not adjustable. Some chairs with armrests available. 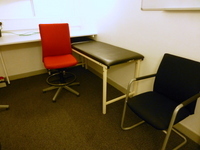 In addition to the consultation rooms, there are three scanning suites, also on the ground floor. 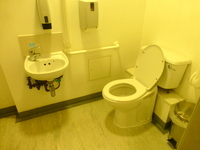 The dimensions of the accessible toilet are 135cm x 200cm (4ft 5in x 6ft 7in). 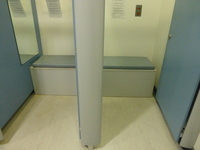 The standard changing room(s) surveyed is/are located off the main corridor. 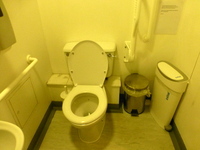 There is one larger cubicle with an outward opening door which is intended for wheelchair users. This room is also used for storage and is usually kept locked. There is a storage shelf above the bench seat which limits the head height at the seat. 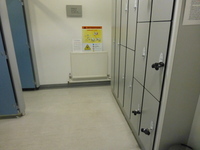 There are lockers within reach of standing and wheelchair users within the changing room. 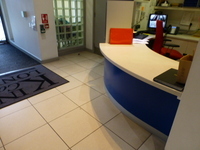 The shared toilets that were surveyed are located to the right of the reception desk. 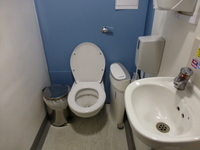 The shared toilet(s) is/are approximately 7m (7yd 1ft) from the main entrance. The mobility aids available include mobile hoists, wheelchairs, shower chairs, commodes, walking sticks, walking frames, hoist slings and adjustable beds. Hearing Loops are available on request. Interpreters are available on request. There are a number of policies specifically relating to safeguarding of vulnerable adults and children, as well as infection control policies. Please contact the health and safety clinical advisors for further information on the hospital. There is a cashpoint within King's Hospital, 100m from the main reception.